Blast engines. Containing plates to scale of large working drawings. With letterpress description. An unusual book describing three different types of blast engines built by the author in the Middlesborough area. 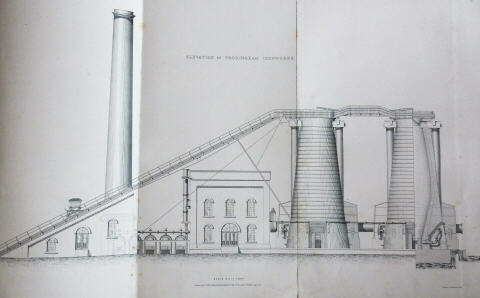 Coulthard built an engine to Slate’s patent in 1857 for Samuelson’s Southband furnaces, though he made some modifications to the original specification, while an engine to Cowper’s design was built to use waste steam from some high-pressure engines at Cockrane's works in Ormsby. Coulthard's own design was for a ball valve engine and he shows two of them at work in the Frodingham Iron Works. Each engine is described in detail and illustrated with a series of working drawings. Folio. (iv) + 11 + (1)pp, 23 engraved plates (3 folding, 2 double-page). Contemporary boards, new leather spine and corners.